Jay porte un t-shirt créé par Vermine01!! votez pour lui!! tu t'es pas fait trop mal j'espère? R : Hello, your beloved boss speaking.. I'd like to know why you're two hours late. I tried to call on your cellphone but i only got the message box. Call me back as soon as possible. I can't hide here forever. I'll have to bluff. Until i find a solution. Anyway... Who could suspect what i did? If you want to know it all, I THINK THE SAME ABOUT YOU! R : Silvère? Where are you?? Hum.. At home.. I had a bad night, i don't feel very well. R : Did you see a doctor? Er... No. I don't think i need it. I feel better. R : Why didn't you call me earlier? I'm sorry.. I didn't notice it was so late. R : Let me know : are you going to work today or not? Yes, of course!! I'll come, excuse me. R : *sigh* Ok. Hurry up. All.. All right, i'm coming.See you. Jay : At last!! Seriously, you're killing me! Do you know who's doing the whole job when you're not there?? -Yes. I know. Take this and forgive me. Jay : Ah. Er.. Thanks. By the way, i've got something for you too. Jay : His lil'bro delivered it at my place. Rocco's still in England with his fiancee. Jay : I haven't the habits to read other's mail. -Oh no, sorry, I didn't mean to accuse you of..
-Maybe i shouldn't, too. At least, not before.. I'm sorry i didn't invite you to my little party, when i came back in France. I was forced to. Aïna forbid me to talk to you. I promised her to keep the secret, to have the rght to leave the complex where i was working for her. You may be thinking i'm joking. I would have thoufht the same, a year ago. And yet, SHE EXISTS, Silvère. I met her. She's cold, insensitive and she use others only to serve her own interests. This is almost six years she keep a woman in a vegetative state, and she never cease to threaten the people who work under her command. And she's after YOU, from the beginning. I don't know where to start, i'm so overwhelmed by the events..
R : The night was that much tough? -Er.. Well... Pff.. I a certain way, yes. R : Will this have an influence on your punctuality again? Try to regain self-control. You look really off the mark today. Do you have any trouble with Aïna again? -Not at all. No news about her. He's right. I must calm down. I can, i must do it. I know all he knows. We just have a different way of thinking. I'm getting out off fine. Well, i guess. At least the players i handled with, looked happy. Some were wondering if i was really the irascible DM Reznor they're used to know. Jennyfer ne va pas être très contente de la tournure que prend cette histoire. Héhé...Je viens juste de lire l'épisode !... 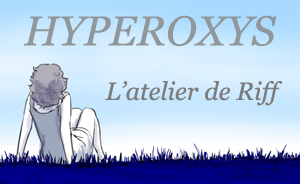 Merci bcp pour le coup de pub...Même si les votes sont terminés depuis un bon moment :D... Je deviens le styliste officiel des persos d'Yskémia ! merci pour les corrections. j'apprécie, je pointe suffisament les fot' des z'otes pour qu'on ait le droit de me remettre à ma place de temps en temps! J'adore l'orthographe féminisée : ça fait soulever un sourcil, mais on continue tranquillement notre progression dans l'histoire, comme si c'était une erreur sans importance... et comme Séleine, on finie sciée, alors qu'on avait été prévenue ! Avant que j'oublie; case 19 (la lettre) "Je l'ai rencontrée, elle est froide, insensible et n'utilisE", et pas ent. Bon, je suis mal placée pour faire la morale, je fais plein de fôtes tout le temps, mais bon, ça m'a frappée. Autre chose qui m'a frappée ... Raj' il a coupé ses cheveuuuuuuuuuux *sanglots* Quel crime! Voilà, maintenant reste plus pour moi qu'à espérer très fort que le vrais Sylvère revienne, même si pour ça la douce Aïna doit disparaîte. Bon, euh ... je vais peut-être te laisser là, je me suis un rien emportée ... Continue comme ça!